Raw organic sugar cane, organic chocolate flavor, organic stevia extract. How To Enjoy: Simply mix 1 scoop of Organic Superfood with 8 oz of cold water or your favorite beverage. Shake briskly in a Greens Plus BlenderBottle. Sip and enjoy! Take Organic Superfood first thing in the morning as a perfect way to energize your day. Organic Superfood can be taken 3 times per day. Add Greens Plus to your favorite protein or smoothie recipe for a nutrient rich Superfood boost! This product ocntains Wheat Grass and is manufactured in a facility that processes Soy and Dairy ingredients. Made in teh USA. How To Enjoy: Simply mix 1 scoop of Organic Superfood with 8oz of cold water or your favorite beverage. Shake briskly in a Greens Plus Blender Bottle. Sip and enjoy! Take Organic Superfood first thing in the morning as a perfect way to energize your day. Organic Superfood can be taken 3 times per day. Organic wild berry flavor, organic stevia extract, citric acid, malic acid. 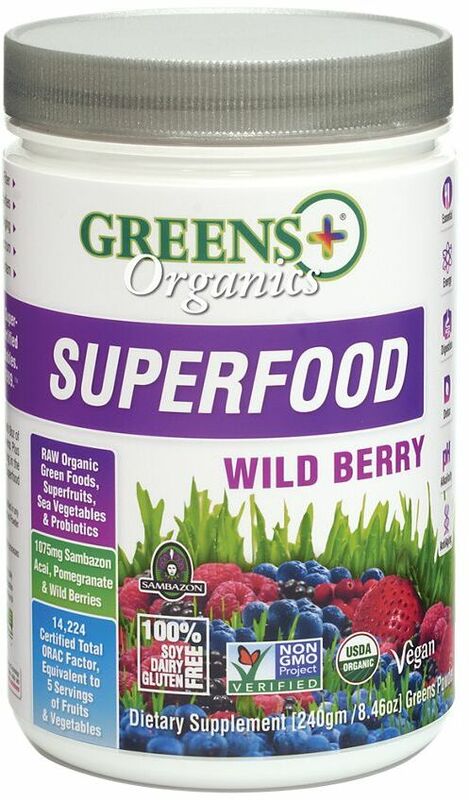 Simply mix 1 scoop of Organic Superfood with 8oz of cold water or your favorite beverage. Shake briskly in a Green Plus BlenderBottle. Sip and enjoy! Take Organic Superfood first thing in the morning as a perfect way to energize your day. Organic Superfood can be taken 3 times per day. Greens Plus Organic Superfood Amazon Chocolate is a certified organic blend of raw green foods, superfruits, sea vegetables, probiotic cultures, and organic cacao. Greens Plus Organic Superfood Amazon Chocolate is purely vegan, and always soy, gluten, & dairy-free. This product contains Wheat Grass and is manufactured in a facility that processes Soy and Dairy ingredients. Other Ingredients: Raw Organic Sugar Cane, Organic Chocolate Flavor Organic Stevia Extract. Simply mix 1 scoop of Organic Superfood with 8oz of cold water or your favorite beverage. Shake briskly in a Greens Plus BlenderBottle. Sip and Enjoy! Take Organic Superfood first thing in the morning as a perfect way to energize your day. Organic Superfood can be taken 3 times per day.